Klein, Jared S., Brian D. Joseph & Matthias Fritz (eds.). 2017. 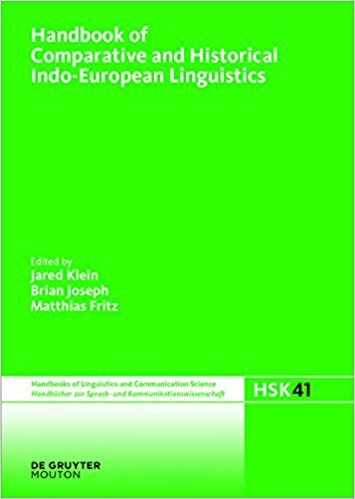 Handbook of comparative and historical Indo-European linguistics: An international handbook (Handbücher Zur Sprach- Und Kommunikationswissenschaft (HSK) 41/1). Berlin; Boston: de Gruyter. This series of HANDBOOKS OF LINGUISTICS AND COMMUNICATION SCIENCE is designed to illuminate a field which not only includes general linguistics and the study of linguistics as applied to specific languages, but also covers those more recent areas which have developed from the increasing body of research into the manifold forms of communicative action and interaction. For “classic” linguistics there appears to be a need for a review of the state of the art which will provide a reference base for the rapid advances in research undertaken from a variety of theoretical standpoints, while in the more recent branches of communication science the handbooks will give researchers both an verview and orientation. To attain these objectives, the series will aim for a standard comparable to that of the leading handbooks in other disciplines, and to this end will strive for comprehensiveness, theoretical explicitness, reliable documentation of data and findings, and up-to-date methodology. The editors, both of the series and of the individual volumes, and the individual contributors, are committed to this aim. The languages of publication are English, German, and French. The main aim of the series is to provide an appropriate account of the state of the art in the various areas of linguistics and communication science covered by each of the various handbooks; however no inflexible pre-set limits will be imposed on the scope of each volume. The series is open-ended, and can thus take account of further developments in the field. This conception, coupled with the necessity of allowing adequate time for each volume to be prepared with the necessary care, means that there is no set time-table for the publication of the whole series. Each volume will be a self-contained work, complete in itself. The order in which the handbooks are published does not imply any rank ordering, but is determined by the way in which the series is organized; the editor of the whole series enlist a competent editor for each individual volume. Once the principal editor for a volume has been found, he or she then has a completely free hand in the choice of co-editors and contributors. The editors plan each volume independently of the others, being governed only by general formal principles. The series editor only intervene where questions of delineation between individual volumes are concerned. It is felt that this (modus operandi) is best suited to achieving the objectives of the series, namely to give a competent account of the present state of knowledge and of the perception of the problems in the area covered by each volume. Prods Oktor Skjærvø: “The documentation of Iranian”, 471–481.